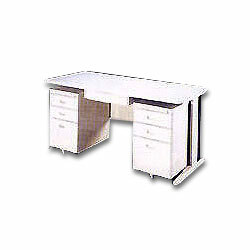 Kuo Jer Enterprise Co. Ltd.
Office Computer Desks, Chairs, K/D Steel Cabinet. 1. We a reliable exporter and manufacturer which has specialized in Computer Chair and Computer desk which produced more over 25 years and always has good reputation in keeping on researching, developing and improving our products with our great effort which results in the popularity by our customers from world-wide countries. 2. Since our products have reached a degree of high quality with competitive price, we have confidence to win the customers kind patronage. 3. We also can supply component parts as customer's request also welcome customer's own design as we had been an O.E.M. maker for many years. 1. W160 x D70 x H74cm. 2. For more product information, please visit our website, or contact us by email for a detailed catalog.